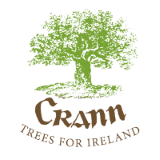 Sunday 25th August 2013: Crann, Ireland’s leading voluntary tree organisation, and Coillte hosted a Family Day between 12 noon and 4 p.m. on Sunday 25th August in Oak Glen in Glencree County Wicklow to celebrate the ‘coming of age’ of Oak Glen. Oak Glen was planted 21 years ago to re-establish an oak forest in Glencree, where there was a royal forest park in the 13th century. Members of the public were invited to bring a picnic and come along for an enjoyable day in the woods. Dale Treadwell was on hand with his bugs and beasties to entertain the children and adults alike. Scrappy aka ‘Harry the Hedgehog’ was a big hit also. There was a tree planting ceremony at 3 p.m., by Paddy Woodworth, to honour all sponsors of trees in Oak Glen. The project was launched in 1990, with the first tree planted by President Mary Robinson and the final oak tree in the first phase planted by Bob Geldof. Members of the public sponsored approximately 120,000 oak trees. These sponsors ‘invested’ through grid referenced certificates in groups of five young trees of which one, on average, would develop to maturity after thinning. The grid referencing is being transferred to a GPS based grid to be accessed through the Crann website – www.crann.ie – or directly through a smart phone link. Tony Carey, Crann’s Chairperson, said: “This unique joint project, between Crann and Coillte, has reached the stage at which the ‘young oak forest park, with its biodiversity in the heart of Glencree valley, can be enjoyed by the public.